In the thirties, before WW2, many aircraft were biplanes, powered by propellers and built using wood and canvas seemingly held together with bits of string. Not long after the war, all-metal jet- and rocket-powered planes were flying near the speed of sound. These rapid developments did not happen without a lot of experimentation. Some of those experiments produced decidedly odd-looking aircraft. Lino Martins (Lino M) is mostly known for building slightly wacky cars, but he has now built one of those wacky experimental aircraft instead. 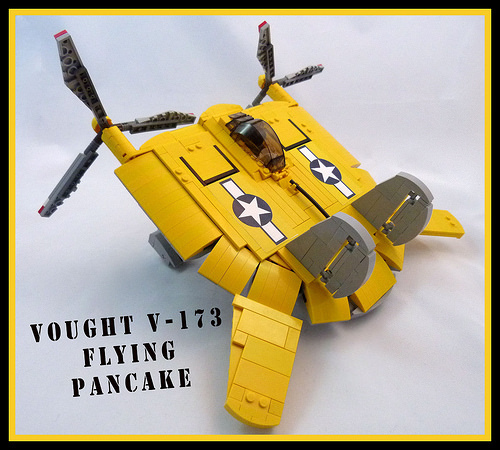 The aircraft in question is the Vought V-173, popularly known as the Flying Pancake. It was built to test the viability of building a fighter aircraft using a low-aspect wing. This was expected to deliver relatively low aerodynamic drag, but with good low-speed handling. The concept worked, but the fighter that it was to lead to, known as the XF5U-1 Flying Flapjack (I kid you not), was overtaken (literally) by more modern jet aircraft. The idea may not have been a success, but as far as I am concerned, Lino’s model is.